Kerri & Adam’s wedding was such a lovely affair with so many personal touches, it’s hard to even know where to start. 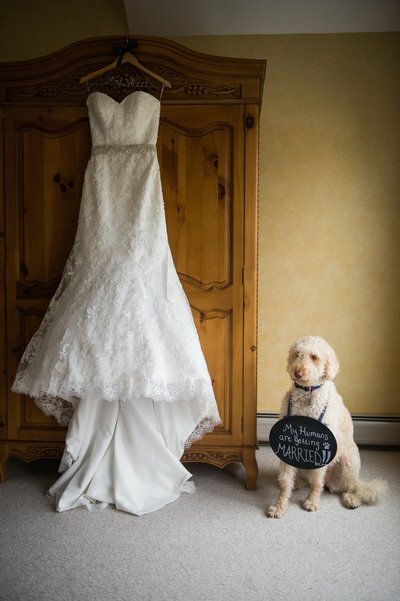 Their wedding day alone took on special meaning. When Kerri called her mom to tell her that they had decided on a wedding date, Kerri learned that her & Adam’s wedding date was on the same day as that of her grandparents! Kerri never knew. It wasn’t until after Kerri’s grandfather passed that photos from their wedding were found. Coincidentally, they had 6 bridesmaids, 6 groomsmen, 1 flower girl, and 2 ring bearers – the same as Kerri & Adam! It certainly felt as though they were with them on their special day. 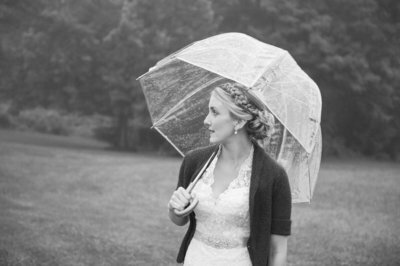 There wasn’t a dry eye in the church once Kerri & her dad started walking down the aisle. After the ceremony, we headed over to Jenny’s Barn and if you haven’t been or are looking for THE quintessential Vermont farm/barn wedding venue, you’ve come to right place. Epic views, a modern barn and delicious food (the ham was killer!). Amazingly fun & beautiful people. Kerri fell in love with zinnias while working at Norris Berry Farm for 11 summers. Every Friday, she would spend hours among a field of zinnias, cutting them and arranging them into bouquets to sell at the farmer’s market the next day. For her wedding day, Kerri planted zinnia seeds in her garage in March when there was still snow on the ground before transplanting them to a field on their property where Adam and Kerri cared for them all summer long. The bridal bouquet was just a special. Kerri’s best friend’s mother, Holly, owned a flower shop when Kerri was growing up and Kerri dreamed that Holly would some day arrange her wedding bouquets. While Holly closed her business several years ago, she happily came out of retirement for Kerri to create this amazing bouquet. The reception was just as lovely as everything else and masterfully Dj’ed by Premier Entertainment & Events‘ Jim. Hand’s down amazing. We snuck out of the reception just around sunset to take full advantage of Jenny’s Barns location surrounded by mountains and rolling hills and had plenty of fun along with Kerri being brave enough to climb into the tractor. Kerri & Adam – I’m so grateful that our paths crossed at Nicole & Troy’s wedding; it was such an honor to document your day for you. Wishing you a lifetime of happiness and adventures (on land or at sea). 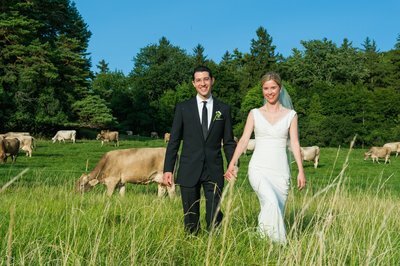 Kat Mooney Photography - as Vermont's best destination wedding photographers, we love photographing your special day in Stowe, Jay, Burlington, Killington & beyond New England. Some of our favorite VT wedding venues are the Mountain Top Inn, Jay Peak Resort, Sleepy Hollow Inn, The Red Clover Inn, TopNotch Resort, Killington Resort, Shelburne Farms, Inn at Mountain View Farm, private residences, 1824 House, The Notch House & many more.